Need a last minute St. Patrick’s Day activity today? Happy Monday! This week’s Unplugged Project theme was green. I decided to help the girls write some Green Poems. This was so fun and easy! We started by talking about all the things we could think of that are green. Then, we wrote simple list-style poems — they talked, I wrote! 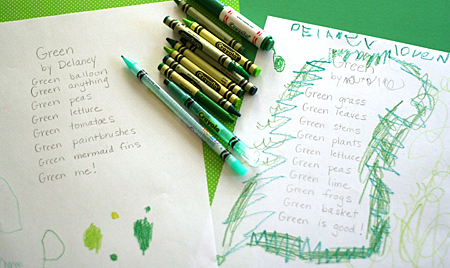 We finished it off with gathering a bunch of green drawing supplies and illustrating our poems. The only suggestion I gave them was to think of an ending for the poem that sounded different than the rest of their poem. I was quite impressed! So sweet! And I love the idea of a Rainbow Color Poem book. I can’t wait to see what types of poems you choose for the other colors! What a cute idea! I’m going to have to try that with my daughter- I’d love to know what she’d come up with. The color book sounds like a lot of fun too- I’ll be following a long for sure! I think that’s awesome that your daughter wants to make a poem for all of the colors! I wouldn’t have thought to try a poem with my three-year-old. I’ll have to give it a shot and see how it goes! Hello! I’ve been a blog follower/fan of Let’s Explore for quite a while – love all the ideas and inspiration, and feel a sense of instant kinship as I also have a Delaney =) I wanted to share – I found a book at a rummage sale last weekend that your daughters might enjoy – it’s called A Kick in the Head, An Everday Guide to Poetic Forms. It looks like a fantastically fun way to introduce the many styles of poetry to children. Natalie’s interest and ambition to do a rainbow of poetry book is awesome and this book might be helpful in exploring poetry. Let me know if you check out the book and what your girls think! Check out the book Hailstones and Halibut Bones, a great book of color poems. What a great idea! I loved the students’ poems! Can’t wait to read the color poem book by Natalie.